The following advertisement is for the official notification regarding the CG Vyapam Lecturer And Teacher Recruitment 2019. The recruitment has contained a total of a huge 14428 posts for the Lecturer & Teacher. All eligible candidates can apply for the same. Chhattisgarh Professional Examination Board published the notification for the recruitment to fill the 14428 vacancies. We are getting the news that the official notification for the CG Vyapam Lecturer And Teacher Recruitment 2019 has been released on the official portal. We are informing you that online applications have begun on 16 April 2019 to 14 May 2019. Here we will give you all the details about this vacancy. You will receive notification of all the latest news and events related to this vacancy. We will provide you regular updates here. 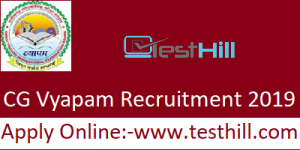 CG Vyapam Recruitment 2019 is available on the official website i.e. www.cgvyapam.choice.gov.in. We will notify the direct link just after its official release. So, stay tuned to www.testhill.com. Many candidates are rushing toward to apply for the CG Vyapam Recruitment 2019. The wait is over now as you can apply for the same from the official website or www.testhill.com. We will keep you update to any latest information about this regard. The direct link to apply for the declared recruitment will be available on this post shortly. All the candidates have to know about their eligibility criteria. Candidates can check it from the below information. Candidates who have passed their Higher Secondary Examination & having Diploma, B.E. led/ Graduation Degree with B.ed and TET passed or B.A.E.d / B.Sc TETexaminationn passed are eligible for this recruitment.